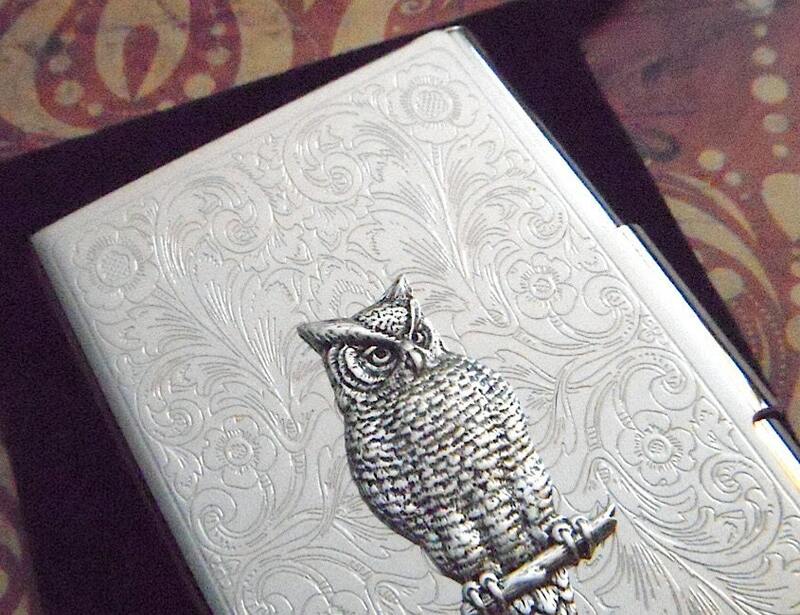 Owl Business Card Case Silver Owl Gothic Victorian Steampunk Vintage Style Card Case Steam Punk Business Card Holder Owl Silver Plated Case - New Slender Slim Size Compact Vintage Style Gothic Victorian Design Scroll Pattern - Original Embellished Card Cases By Cosmic Firefly Las Vegas. Owl Business Card Holder Victorian Vintage Style. Features a sleek rounded bullnose front and back top edge. Original Design, Description, & Photos Copyright © Cosmic Firefly Las Vegas. "Love, Love, Love this! Beautiful craftsmanship and great presentation! A gift to my husband, whom uses it daily, and he loves it too. Can't wait to get myself one!" Size of case is 3 5/8 inches long by 2 5/16 inches wide by a slender 5/16th of an inch thick, the case is thicker if you add in the thickness of the owl shape which is about another 1/8th of an inch thick. Holds about 15-20 standard size business cards or you can also use it for 5 or 6 plastic credit cards or even a few paper money bills. Engraved into front surface of the case is a Vintage German Art Nouveau Scroll Work Design. The raised Owl embellishment on the front is a vintage design with incredible detail and an antiqued silver plated finish. The owl is machine stamped from sheets of brass using the original die mold machinery from the 1930's-1950's then silver plated and antiqued. This sturdy metal hinged case stays securely closed until you open it with the small latch tab on the side. This is a nice compact size that really makes carrying your business cards FUN again. Make the Ultimate Classic Victorian Fashion Accessory Statement and carry it in your bag wherever you go. We have actually sold one of our cases to an extremely well-know female Rock Star who buys unique accessories on Etsy and she totally Loves it! We also make this design as a cigarette case which is a thicker case with more roominess and depth if needed.